The tune follows “So Far Under” and the lead track, “The One You Know”, as the third song issued ahead of the project’s late summer arrival. 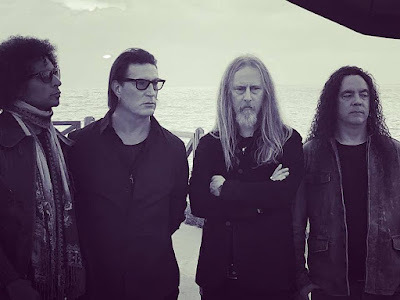 Alice In Chains recorded their first album in five years at Seattle’s Studio X, the same facility where they tracked 1995’s self-titled album (back when the studio was known as Bad Animals); the recording process also saw the band spend time at Henson Recording Studios in Los Angeles and at the Nashville studio of producer Nick Raskulinecz. “Rainier Fog” will be available digitally, as well as on CD and limited-edition double 180-gram clear LP with white and black splatter - available only from the band’s online store. The set marks the follow-up to 2013’s “The Devil Put Dinosaurs Here”, which debuted at No. 2 on the US Billboard 200 upon its release in 2013. Major League Baseball’s Seattle Mariners will host an Alice In Chains Night at Safeco Field on August 20 to help the band celebrate the release of "Rainer Fog" before the group launches a North American tour in Vancouver, BC on August 22.